Forget about carryout pizza. These mini homemade pizzas are faster, lighter and way more fun for kids to eat. This easy pizza recipe features baking mix, mozzarella cheese, pepperoni and Italian herbs combined in a mini muffin tin. In just a few minutes, they emerge from your oven as tiny pizza puffs perfect for dipping. 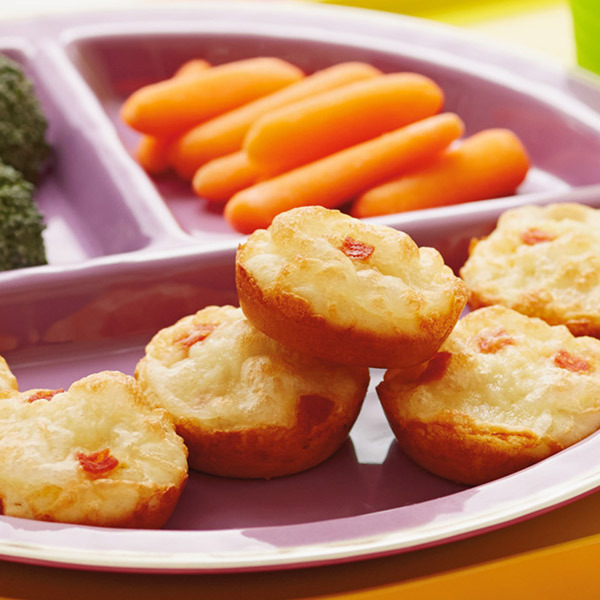 Try these bite-sized pepperoni pizzettes for a quick school-night dinner or kid-approved appetizers at your next gathering. Mix together baking mix, milk, egg, onion and garlic powders, and Italian seasoning. Stir to combine. Mince pepperoni slices, and then add to batter. Spray 2, 12 cup mini-muffin pans with nonstick spray. Pour about ½ tablespoon batter into each muffin cup. Then top each muffin cup with ¾ tablespoon shredded mozzarella. Bake for 8 to 10 minutes, or until cheese is melted and bubbly.